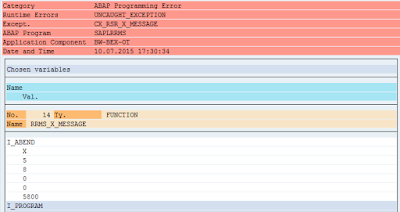 There are different types of ABAP dump one may encounter while working with SAP BW. Many of them are quite tricky to read. Even skilled BW developer or ABAP developer can be surprised at the end what really an issue was about. I just name few examples that can be seen here or here. What is an issue is that actually there are many areas within the dump that need to properly reviewed in order to come to conclusion of what is going on. Basically what we use once we look at the dumps is that we just review it very briefly w/o detail look at some of areas. Chosen variables - area lists out variable values at the time of dump. In many cases there might be values which may lead us to solution or at least gives us a clue of what is going on. In example below there was a very generic dump: UNCAUGHT_EXCEPTION / CX_RSR_X_MESSAGE. Symptoms of the issue was that load to DSO was just failing w/o any obvious evidence of what is wrong. Monitor of the data load request was just read, no log or anything else was present. Finally someone took at this this part of the dump and there was an IO mentioned = 0WEEKDAY1. While looking up the IO name in support.sap.com an SAP Note (2079842 - Time check: Termination _CHECK_PART_TIME_WO_FINEST-6-) with solution was found. 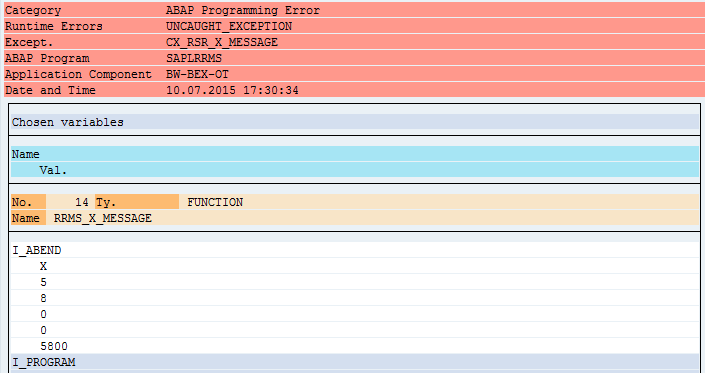 Therefore always pay attention to this part of the ABAP dump! What are SAP GRC solutions?